(NaturalNews) As fear of the Zika virus spreads throughout the United States, authorities are desperately looking for ways to protect their citizens. As reported by Circa, over 1,000 people in the U.S. have been infected with the Zika virus, which is believed to cause severe birth defects like microcephaly. One of the primary weapons to kill the disease-carrying mosquitoes is the use of aerial pesticides – chemicals that are sprayed from airplanes and helicopters. While the number of states using aerial spraying or fogging campaigns to kill off mosquitoes is rising, some scientists are raising serious questions about their safety. One of the chemicals being used is an Environmental Protection Agency (EPA) approved insecticide called Naled. Naled is a neurotoxin that kills adult mosquitoes. While this compound will provide protection against the Zika virus, there are several huge problems linked to its use. In addition to killing important pollinators such as bees and butterflies, scientists found that high exposure to commonly used chemicals such as pyrethroids and the organophosphate trichlorfon could have severe negative long-term health effects. Trichlorfon, one of the main ingredients in Naled, has been associated with an increased risk of cancer, autism and birth defects. A 2014 study conducted at the University of California, showed that pregnant women living within a few miles of farms where pesticides like Naled were sprayed had a 60 percent increased risk of their child developing autism spectrum disorders or experiencing developmental delays. Dr. David Perlmutter, a board-certified neurologist, said that authorities need to take a step back and look at the broader picture of these spraying interventions when weighing up risk versus benefit. "We should prove safety and not just say well because it hasn't been proven detrimental it's ok. That's not good enough," he said. Besides causing autism, substances like pyrethroids have been linked to breathing problems, involuntary twitching, seizures and cancer. The EPA has even classified them as likely to be carcinogenic to humans. Nonetheless, pesticides containing pyrethroids or trichlorfon are being used in Zika response plans in many U.S. cities. According to Joseph Conlon, a spokesman for the American Mosquito Control Association, there are far better strategies to combat Zika than spraying or fogging with harmful, autism-causing chemicals. He said that the most effective way to combat disease-carrying mosquitoes is to get rid of all water containers and trash around the house. Water and trash are the breeding grounds for mosquitoes. Get rid of those, and you'll get rid of the mosquitoes too. Unfortunately, instead of educating people, health workers keep fighting mosquito-borne diseases through the use of harmful chemicals. First of all, make sure to protect yourself against dangerous bugs and mosquitoes with a decent, natural bug repellent. This will help you to avoid a Zika infection in the first place. 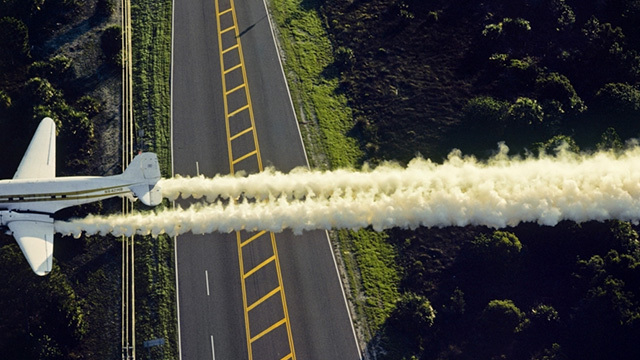 Furthermore, the use of pesticides to stop the Zika epidemic is unlikely to stop, so you should protect your family from dangerous aerial spraying or fogging chemicals; get your hands on the spray schedules for your city or neighborhood. As reported by The Institute For Natural Healing, most aerial mosquito spraying occurs in the two hours before sunset and the one after. Make sure to stay inside during these times, and don't forget to close windows and keep your pets inside. Also, make sure to get clothes and toys inside, and cover sandboxes and swimming pools. If you must be outside, make sure to wear long sleeves and pants, and cover your mouth with a mask. If you have a vegetable garden, always make sure to wash your produce thoroughly to remove pesticide residues.